Here comes the bride! 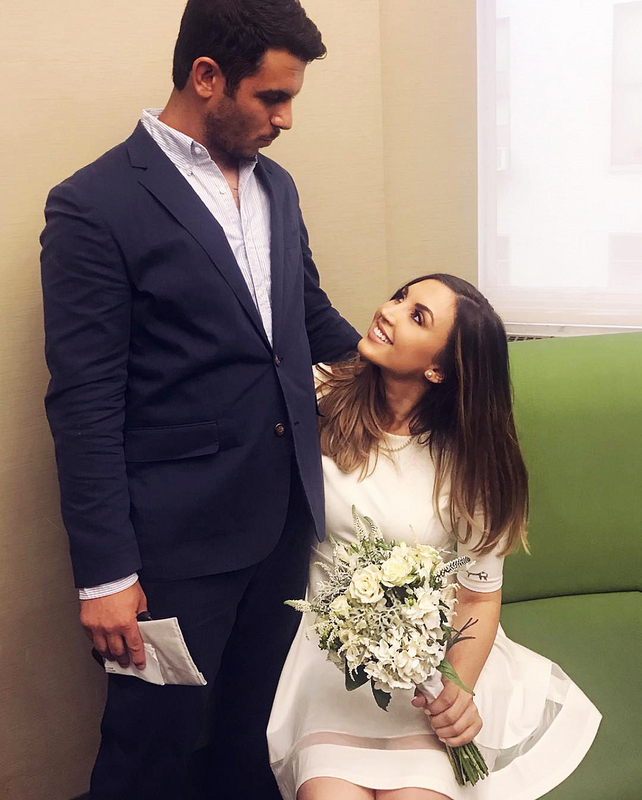 Jacqueline Laurita’s daughter, Ashlee Holmes, married fiancé Peter Malleo at the New York City Marriage Bureau on Wednesday, August 8. The makeup artist, 27, announced the news via Instagram with a photo of herself and her new husband. She wore a knee-length white Lulus dress that featured a high neckline and a sheer panel around the bottom, while he sported a navy J. Crew suit with a button-down shirt. The groom matched the bride’s casual, non-traditional look by forgoing a necktie and leaving his shirt partially unbuttoned. The couple welcomed their first child, a son named Cameron Hendrix, in August 2016. Laurita shares Holmes with her ex-husband, Matt Holmes. The former Bravo personality is now married to Chris Laurita, with whom she shares sons C.J., 16, and Nicholas, 9.